Mention Burgos and any Spaniard’s mouth will start watering at the thought of the famous lamb from that area. 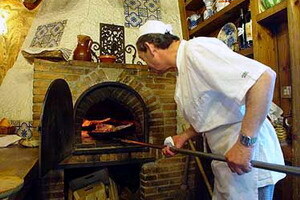 Considered the best in Spain, the local lamb, known as Lechazo, should be unweaned, of the Churra, Castellana or Ojalada breeds, and roasted in a wood fired oven. There is an Association of Assadores de Lechazo de Castilla y Leon, look out for their symbol on the restaurant door as a sign of quality. The other gastronomic symbol of Burgos is its famous morcilla, a black pudding made with rice, there are many poor industrial versions but an authentic one from a good butcher can be a real treat!